As best we are able to determine, brewing emerged more than 5,000 years ago in the grasslands of southern Babylonia, between the Tigris and Euphrates Rivers. Rich alluvial soils supported wild grain plants, and the people there gathered them for food … and to make beer. How was the discovery made? It is impossible to be sure. But grain left out in the rain will sprout, essentially starting the malting process and developing enzymes inside the seeds. Someone coming upon a sprouting grain store probably hurriedly went to make bread out of the grain before all of the nutritious starch was lost to the growing plants. Upon heating, the starches, now full of enzymes, liquefied into sugars. And once people had sugars, they knew what to do with them. The Babylonians eventually conquered Sumer, and one of the benefits was the adoption of the superior beer-making skills of the people they had vanquished. The Babylonian king, Hammurabi, promulgated laws about just about everything, including beer, which he categorized into 20 different varieties. See law. The beer culture of Sumer also made its way into Egypt. According to Dr Delwen Samuel, who did pioneering work at the Department of Archeology at the University of Cambridge, brewing was well established in the Egyptian predynastic period. By the early Dynastic period, 3100–2686 bce, it had become an important part of Egyptian culture. Eventually beer, far healthier than water, became the everyday drink of the Egyptian people, from Pharaoh to the lowliest peasant. Great grain stores were built, and the Egyptian economy was underpinned by bread and beer. The god Osiris held in his hands the very stuff of life—fertility, death, resurrection, and the brewing staff. Depictions of people drinking beer from jars through long straws cover the insides of Egyptian tombs. We still have the beer-drinking straws of potentates, handsomely inlaid with gold and lapis lazuli. When the Greeks arrived in Egypt, they were unimpressed by beer, which they called zythos, referring to its foaminess. Preferring wine, they thought of the sprouted malt as a form of rotted grain and disdained the drink the Egyptians derived from it. It was not that the Egyptians did not know wine, but growing grape vines, in many parts of Egypt, was not nearly so easy as growing grain, and Egypt could grow enough grain to feed itself and still have some left for export. The Egyptians brewed from several grains, including barley and the ancient wheat type, emmer. Texts make mention of many types of beer, some of them clearly designated for ceremonial purposes. They had “dark beer,” “sweet beer,” “thick beer,” “friend’s beer,” “garnished beer,” and “beer of the protector.” The gods who guarded the shrine of Osiris partook of the “beer of truth.” For funerary purposes, they needed a beer that would last until the afterlife and provided tombs with “beer that does not sour” and “beer of eternity.” Massive breweries were built, and both grain and beer were offered in payment for common labor. It is worth noting that brewing was largely the work of women, a tradition that lasted throughout various civilizations until the end of the Middle Ages. In 332 bce, the Greeks, led by Alexander the Great, took control of Egypt. Brewing continued apace, but the Greeks, seeing beer as the drink of their rivals and of the conquered, largely disdained it. By the Hellenistic period, Egypt exported beer out of the city of Pelusium, at the mouth of the Nile, to Palestine and beyond. The tax inspectors arrived, carrying titles such as “Inspector of the Breweries” and “Royal Chief Beer Inspector.” Alexander’s reign as Pharaoh lasted less than a decade, but Egypt was ruled by the Ptolemys until the naval battle at Actium in 31 bce, after which Cleopatra and her lover Marc Antony took their lives. Egypt became a Roman province. In the south of present Germany, the Romans encountered the Celts, and in the north they found the Germans, who had followed the Celts into Western Europe out of Asia. These tribes, unlike the Romans, were largely illiterate, but they were fairly proficient at making beer. The nomadic Germans eventually drove the Celts out, across the English Channel into Britain. The Germans and assimilated Celts settled into a network of powerful city-states between the 6th and 7th centuries ce. Slavic tribes settled to the east. As the Roman Empire finally crumbled with the abdication of the last Roman emperor in 476, the Romans, Germans, and Slavs assimilated into each other’s cultures, and Western Europe took on Roman Catholicism. Monasteries were set up and became places of learning. To sustain themselves and provide hospitality for weary travelers, the monks established breweries. During the 500 years of the Dark Ages, from 500 to 1000 ce, brewing continued, but largely without advancement. The light of civilization shone most brightly inside the monasteries, but the monks kept their beer to themselves. Copper smelting had been used since the Bronze Age, but until now, brewing kettles in Europe had largely been small vessels, suited for households. Now settled into larger communities, Europeans started to build breweries on a scale that had not been seen since the days of ancient Egypt. Breweries moved out of kitchens and into purpose-built facilities, with malting facilities, mashing vessels, fermentation areas, and staffs of trained workers. Coopers made barrels for storage. The flavoring for beer was usually a blend of herbs called gruit, but in some areas the hop was used too. By the early 800s, the monks of the monastery of St. Gallen in Switzerland had built the first full-scale brewing operation in Europe, in many ways hundreds of years ahead of its time. The brewery’s floor plan, drawn up in 820, would be essentially recognizable to any modern brewer. See st. gallen. In the early 1100s, Hildegard von Bingen established the Benedictine nunnery of Rupertsberg, near the town of Bingen on the river Rhine. Later known as St. Hildegard, she wrote a number of books, including the natural history text Physica Sacra. In it, she described the hop as a particularly useful plant, one that was excellent for physical health and preserved all sorts of drinks. Over the 1100s, much of Europe’s beer was transformed by the use of hops. The Catholic Church, which was making a fair amount of money selling gruit, resisted mightily. But the hop evaded the reach of the Church and began to grow deep roots. Soon central Europe grew into a brewing powerhouse. Ordinances were promulgated to protect grain supplies and beer purity, from Augsburg in 1158, from Paris in 1268, and from Nuremberg in 1293. 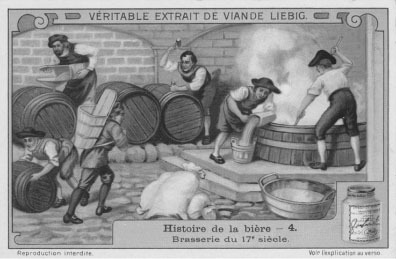 These were early forerunners of the now famous Reinheitsgebot of 1516, Germany’s much vaunted “Beer Purity Law.” By the mid-1300s Hamburg became the leading brewing center in the world. By 1376, 475 of Hamburg’s 1,075 manufacturers were making beer. Their techniques were now far advanced over those of any rivals and in 1369 they sent a full 133,000 hl of beer out of the city. On the backs of the brewers, the Hanseatic League, which had been founded by wealthy merchants from Lubeck and Bremen in 1241, grew powerful. The Thirty Years War, from 1618 to 1648, ushered in nearly a century of misery and death in Europe. Warfare raged across the continent, and the population was halved by violence, disease, and starvation. European brewing moved back inside the home. Commercial breweries revived only in the 1700s, with brewers guilds well established throughout central Europe, charged with protecting the interests of a once again increasingly powerful clan of merchants. In Britain, hops had not yet arrived, but gruit-flavored beer had long been the drink of the people. See gruit. When Julius Caesar arrived in Kent in 55 bc, of the people he found there he noted, “They had vines, but use them only for arbors in their gardens. They drink a high and mighty liquor …, made of barley and water.” Wine certainly arrived in England early, first with the conquering Romans and later with the Normans in 1066. As the Normans assimilated into British society, the upper echelons brewed beer, but kept the Norman taste for wine, and British society separated into a wine-drinking upper class and the beer-drinking masses. Brewing remained a cottage industry though the Middle Ages and was once again dominated by women. By the 1200s, an Assize of Bread and Ale was promulgated, regulating the price and quality of both. Fines for breaking the rules essentially became a form of licensing system, and the records of the fines paid by brewing households allow us to trace the development of brewing families in Britain over generations. See britain. Although brewing was a household skill expected of all medieval women, some women, known as alewives, began to set up small commercial operations on a part-time basis. Sometimes they were allowed to open alehouses, and their incomes would provide them with a rare measure of independence. It was virtually the only honest independent work that women were allowed, and they took advantage of it at every opportunity. See women in brewing. After the Black Plague struck England in 1348–1350, demand for ale rose, and female brewers became better established. Soon, however, men and the demands of commerce would conspire to wrest the brew kettle from women’s hands. As hopped beer spread throughout Europe, the preservative effects of the hops meant that beer could be kept longer. Now beer could be made in greater quantities and stored, as opposed to being drunk within a matter of days. Storage and larger facilities required money to build, and women had less to invest with than men did. Slowly, but surely, men began to build larger brewing operations and force women out of their own businesses and into employment in the new breweries. Hops moved into England in the 1400s, and although many people clung to unhopped ale for more than a century, British beer was largely hopped by the mid 1500s. So, in the morning, after we had called upon God for direction, we came to this resolution: to go presently ashore again and to take a better view of two places which we thought most fitting for us. For we could not now take time for further search or consideration, our victuals being much spent, especially our beer, and it now being the 20th of December. As colonial cities grew during the 1700s, so did breweries. City breweries brewed the same sort of beers as were found in England during that time, often supplementing malt with other sugars, such as molasses. Farmhouses brewed with barley malt, wheat, corn, pumpkins, peas, and spices. See pumpkin ale and brewing in colonial america. In the meantime, the Industrial Revolution in England was giving rise to a recognizably modern brewing industry. As London boomed, dark porter beer fueled the city, and the city fueled the breweries. Brewed from brown malt, heavily hopped, and matured for months, porter beer lasted well enough to be distributed throughout London’s thousands of pubs. The erection of enormous porter vats gave brewers the ability to blend large amounts of beer and achieve some level of reliability. The English brewers were voracious in their search for new technologies. 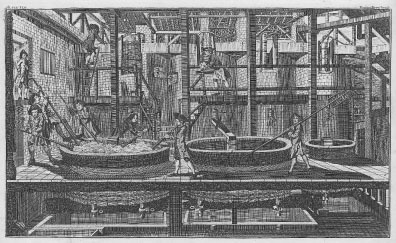 In 1784, only 8 years after American independence, Henry Goodwin and Samuel Whitbread installed a coal-fired steam engine in their London brewery. Twenty years later, indirect kilning of malt was combined with the use of thermometers to produce a regular supply of pale malts. Soon, porter brewing eschewed inefficient brown malts, productivity increased, and India pale ale shipped out to Calcutta in huge volumes. See industrial revolution. Bavarian brewers, in a skilled display of industrial espionage, stole the secrets of pale malting technology from the British. They then used that secret to take over the world of brewing. Bavarian brewing had been different for centuries. Duke Albrecht V of Bavaria, seeking to protect the populace from spoiled beer, forbade summer brewing in 1553. Brewers made the last beer of the season in the late spring, and it needed to last months until the autumn. Seeking to make beers that could survive the summer heat, brewers had been fermenting their beer in underground caves dug deep into hillsides. Down into the tunnels they dragged ice, hand cut from frozen lakes in winter, to keep the beer cool throughout the year. Over time, their beer, and the yeast that was fermenting it, changed. One species of yeast stepped forward under the cold temperatures whereas another receded. The lager yeast, so named after the German word “lagern,” meaning “to store,” was able to ferment at low temperatures, outcompete spoilage organisms, settle the bottom of the fermenting vessel, and, after a few months of aging, produce a beer that could last much longer than other beers. By 1840, Bavarian-born John Wagner, using yeast he brought with him from his homeland, was brewing lager beer in a hut next to his Philadelphia home. Back in Bavaria, in 1841, the first light amber beers emerged from the Spaten Brewery in Munich and from Anton Dreher’s brewery in Vienna. Only 2 years later the Bavarian brewer Josef Groll, working at a brewery in the Bohemian city of Plzen, produced the first golden lager beer, the pilsner. See dreher, anton, spaten brewery, and vienna lager. Soon, a new railroad network was bringing the sparkling new beer to cities far from Bohemia. Industrialized glass making brought affordable glassware to people previously used to crockery mugs, and the bright golden pilsner beer was made that much more appealing. The introduction of Carl von Linde’s ammonia-based mechanical refrigeration technology freed lager brewing from a dependence on natural ice. See linde, carl von. By 1873 beer could be brewed anywhere there was a decent water supply and at any time of year. Essentially Bavarian styles of beer were soon brewed from Brazil to Tanzania, sweeping ales from most of the world map. England and Ireland held firm against the tide, as did the Rhineland with its kölsch and altbier, and, very quietly, so did tiny Belgium. Keeping fast to its centuries-old traditions of spontaneous fermentation, Belgium kept alive an ancient brewing style, while inside its Trappist monasteries, elegant new permutations of the brewer’s art were conjured by silent craftsmen in robes. See altbier, kölsch, and trappist breweries. Throughout Europe and the United States, breweries built great empires of commerce in the late 1800s. Britain built its fortunes on ales, whereas central Europe, Scandinavia, and America focused on lagers. By 1900, three of Japan’s current top four brewing companies were already well established. Two world wars brought changes to breweries everywhere, but soon one great brewing nation was to leave the trade entirely. Although American lager had already diverged from its European roots, using a proportion of rice and corn to replace malt, it was the 13-year “noble experiment” of Prohibition, from 1920 to 1933, that changed American beer for the next 60 years. See prohibition. When brewing re-emerged from the underground economy in 1933 and America’s breweries came back to life, the beer was different. Beer had been gone a long time, and the world had changed. Commerce, technology, and advertising converged to produce the modern American mass-market beer, a technically impressive product with far less flavor than its ancestors. The new beer took its place on shelves next to sliced white bread in plastic bags and slices of “cheese food product,” foods apparently impervious to time itself. Americans were happy enough with the new beer, but once they started traveling, they soon realized that they had been missing something. The 1970s and 1980s saw a time of renewal, first in England’s new microbreweries and then in the American West. American craft brewers, inspired by Europe’s great traditions, primed by years of experimentation in their own kitchens and believing that brewing can be a jazz-like art form, today spread a gospel of full flavor and creativity in beer.